We took a most exciting inland side trip for about a week! We met our friends on Meridian Passage, a wonderful Canadian family of 5 (parents Julia and Paul, their daughter Erin 22, son Michael 19 and Erin’s boyfriend Geordie 23) and planned a whirlwind trip to the famous Copper Canyon. The trip involves a LOT of sitting on various modes of transport which may have been its only drawback. We left very early to catch the first class bus to a town north of Mazatlan called Los Mochis. The trip was 5 hours but very tolerable as the bus was air conditioned and the driver showed consecutive movies throughout the trip—usually in English with Spanish subtitles, but 2 of the movies were foreign films, one was in an Australian native dialect and the other in German. They were good movies nonetheless and it was a good way to pass the time. From Los Mochis, we took a “local” 2 hour bus to a town called El Fuerte on the Rio Fuerte (river), one of the stops on the Ferrocarril Chihuahua Pacifico, the Copper Canyon train. Dinner was at the fanciest hotel in town and was, in truth, forgettable although the garden setting was lovely. During our wanderings, we visited another hotel lobby that was strikingly beautiful and Richard walked around after picture taking to find Betsy with an elderly man kneeling at her feet?! He and Betsy were talking about their respective travels and he had just learned that she was traveling by sailboat down the coast and he was kneeling in impressed respect. Richard was quite amused. It was the first time in a while that we were around people who aren’t boaters and we forget what an unusual things it is to cruise in a sailboat. Early the next morning we took a cab to the train station where we caught the famous train. We took the Primera Express, the first class train, as recommended. The train was like the best of the European trains with a lovely bar car and dining car. The seats were comfortable and it was nearly full, mostly with tourists. We met lots of others planning a similar journey, most of them had been traveling by land. Our destination was Creel, a town about 2/3 of the way to Chihuahua, the terminus of the train. The train went through the most stunning landscape and was an engineering marvel. The altitude goes from a few hundred feet above sea level to about 8000 feet. As the train climbs, it goes through 87 tunnels, the longest a little over a mile, and over 37 bridges, the longest 1638 feet. It loops back on itself and has one hairpin turn cut all the way through the rock. The drop off on some sides is precipitous. 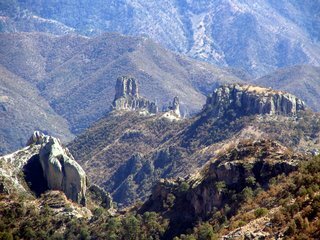 The scenery is evocative of Colorado or Arizona and, indeed, the Sierra Madres are a continuation of those mountain ranges. In the lower elevations there is cactus growing, but at the top are beautiful conifers (mostly pines) and oaks. The air smells of pine and is very clear and dry (and somewhat devoid of oxygen). The train rattled and lurched through this stunning landscape throwing the passengers around as they tried to move through the cars to get views in between for picture taking. Thank goodness for our sea legs—they came in handy. Richard and Erin took tons of pictures hoping for a few good ones. At the train stops, we started to see the Tarahumara people selling their wares. More on that in a minute. At a 15 minute stop in Divisadero, one can walk to the most striking view of the canyon that we got in the train trip. The view is as grand as the Grand Canyon—the rocks are a bit less red and there is a bit more vegetation, but the canyon is very striking. It is, in fact, deeper than the Grand Canyon and the Copper Canyon actually refers to a series of several canyons and riverbeds that, in total, take up more square miles than the Grand Canyon by far. 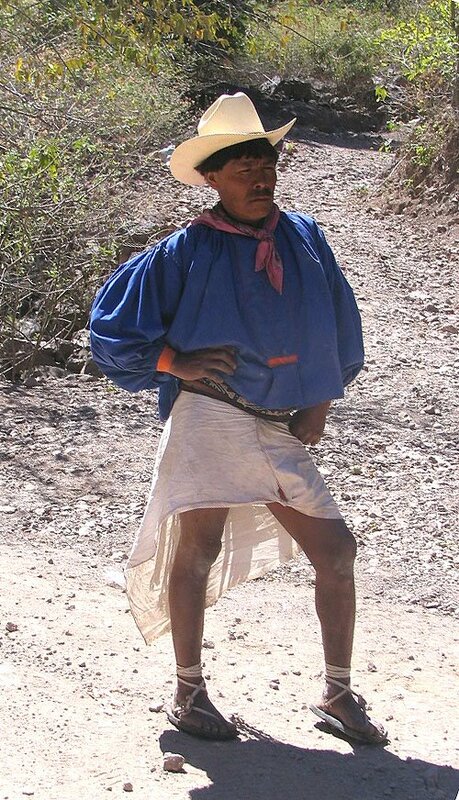 But the real attraction of the trip is to see and learn about the Tarahumara people, a native group populating the canyonlands since at least 1400 AD. Their origins are not clear but they may be related to the Pueblo peoples who lived in Colorado (e.g., at Mesa Verde) in the same time frame. 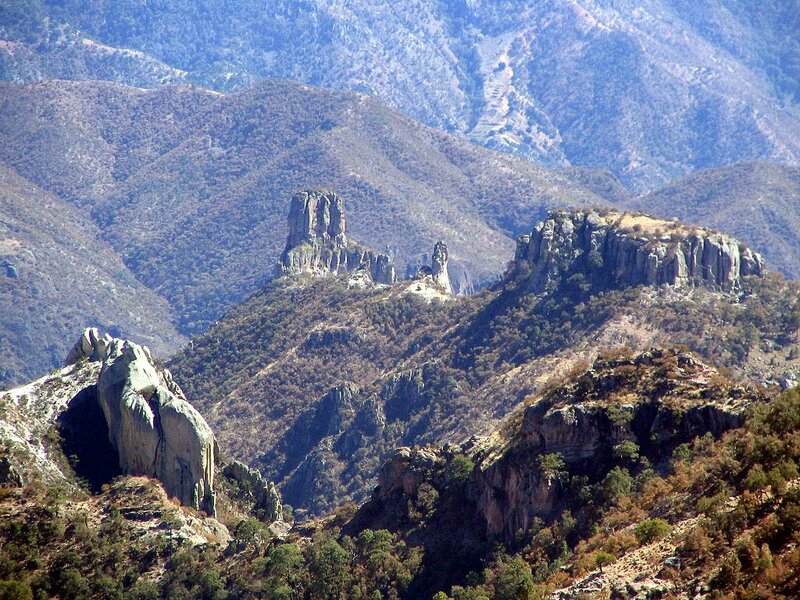 The Tarahumara are estimated at a population of 60,000 and they live in caves or simple houses throughout the canyons. They travel seasonally and have a few cattle and do some rudimentary agriculture. They also make stunning crafts which they sell to us tourists, specializing in woven serapes, belts, bracelets, beaded jewelery, wooden carvings, dolls and stunning baskets made with pine needles, grasses and other local flora, pottery, etc. They are known as great runners and, indeed, one of the men’s games involves a race kicking a ball 60 km through the mountains and the women do a comparable game with a ring that they throw like a Frisbee. Probably even more stunning is their traditional clothing—the men wear a skirt like bottom and bright jacket like shirts. The women wear stunning bright socks, skirts, blouses and head scarves none of which usually match but all of which catch the eye. The young girls carry their infant siblings on their backs in slings while the mothers and grandmothers make their crafts and sit at markets selling them. They were converted to Catholicism first by the Jesuits and next the Franciscan missionaries, but they also retain their unique spiritual religion with traditional healers, herbal remedies and spiritual ceremonies. They live in extended family groups. 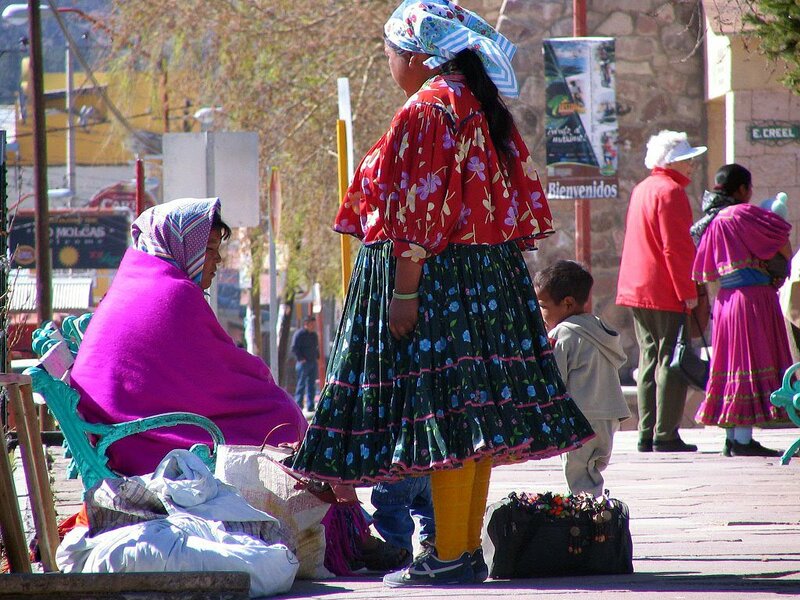 In Creel, the town where we based our travels, the Tarahumara walked and mixed with the local rancheros and set up their wares on blankets in the main square and near the train station. In the canyon, we saw them in their settlements, usually an extended family in a cave or shack with many animals including goats, cattle, pigs and ever present dogs, the latter hanging out with them while they sold their crafts in town or on the frequented tourist hiking trails. The children often had runny noses and coughs (in fact they seemed to cough on cue as the tourists walked up) and sores on their faces and the dogs were thin and sometimes had sores too. In other words, we felt we wanted to help in any way we could. They were very shy and rarely answered as we greeted them, “Buenos dias” or asked them questions in Spanish. The older Tarahumara clearly turned away from the cameras and the children tended to just giggle and stare if we tried to talk to them. Throughout our trip, we all bought many of their crafts, sometimes with just the plan of helping out financially rather than because we loved the items we bought. In Creel, we stayed in a hostel type hotel, Casa Margarita, where dinner and breakfast were included and served at long tables family style. Because it was a popular and inexpensive place, it was always full and we met interesting people there, often several languages being spoken at dinner—a French speaking family from Quebec, a French group from France, an Italian man, Germans and always English and attempts at Spanish. In fact, many of the travelers were quite adept at Spanish, traveling with backpacks throughout Mexico. The proprietress of the hotel, Margarita, had a total of 4 hotels in the canyon area and had obviously done very well. She and her staff helped organize various tours which we took advantage of, but it clearly helped to have some facility with Spanish as the guides did not speak English. We took a driving tour the first morning to some local sites including a Tarahumara family living in a cave (it was a bit awkward to march into their “complex” and stare at them as they stared at us so we always bought a little something from them). We saw Lake Arareko (horseshoe lake) which was beautiful and some striking rock formations of the area including Elephant rock. We drove a riverbed (yes, through the river at times although it was the dry season and the water was quite minimal) to a local waterfall, the Cusarare Cascara. There we walked through the woods (past many Tarahumara with their crafts set up on blankets on the rocks in the woods) to the waterfall which was stunning, and down the 267 steps to the bottom of the falls. That afternoon, the young ‘uns (Erin, Michael and Geordie) went with Betsy on a 2 hour horseback ride. Fortunately, Betsy was experienced because the guide spoke little English (like none) and gave essentially no instruction on riding, a little alarming because nobody else had much riding experience. Fortunately, they were good athletes and sat the horses well and a good time was had by all. As with other riding experience I’ve had in Mexico, the horses were energetic and the guides not at all adverse to trotting and galloping the horses so we had a splendid time galloping down a couple of the trails. We were all chapped and sore after only 2 hours, but we saw beautiful scenery, visited some more Tarahumara in their cave home and were very happy with the experience. Throughout our travels the Grants were fantastic travel partners. About 20 years ago they traveled with Julia’s parents in the very same sailboat over 2 years down the Pacific coast to Mexico, across to the Marquesas, through the South Pacific, down to New Zealand, back up to Tahiti, Hawaii and back to British Columbia, all this when Erin was 6 mos. to 2.5 yrs of age, Michael not yet born. Now they are on the same boat traveling with the next generation and planning a one year voyage, here, then out to Hawaii and home to BC. They are even tempered and still enjoying one another’s company (five on a 43 foot boat—truly remarkable). They are good travelers, planning ahead. They brought candy for the children we met and toys for some and, believe it or not, dog biscuits for the mangy, starving looking dogs we met as well. Geordie is quite disciplined and had taught himself good Spanish from a computer CD on the way down and, between him and Betsy we got along with our guides and the many situations we found ourselves in while traveling. The “kids” opened more doors for us all. Geordie, among his other talents, is a magician. Often he felt the children we met didn’t “get” the magic, but, finally, at the train station before our trip home, he captured the attention of a mixed crowd of kids, adult Tarahumara and some local Mexicans while he did trick after trick to their amazement. With a French family, he passed on a coin trick that he had an extra copy of and taught the kids to do the trick, all using his French he studied growing up Canadian, and doing the trick in Spanish for the Mexicans. He was quite a bright young man and always fun to be around. The dog biscuits netted us a few dogs who adopted us once they were fed, one pair even waited almost an hour outside the museum for us one day. We all took a van tour down the canyon to a town called Batopilas. The drive is a harrowing 5-6 hour ordeal especially for Julia who is particularly acrophobic (fear of heights). The first 75 km are on a paved road and were beautiful through the high altitude mountain pines we loved. 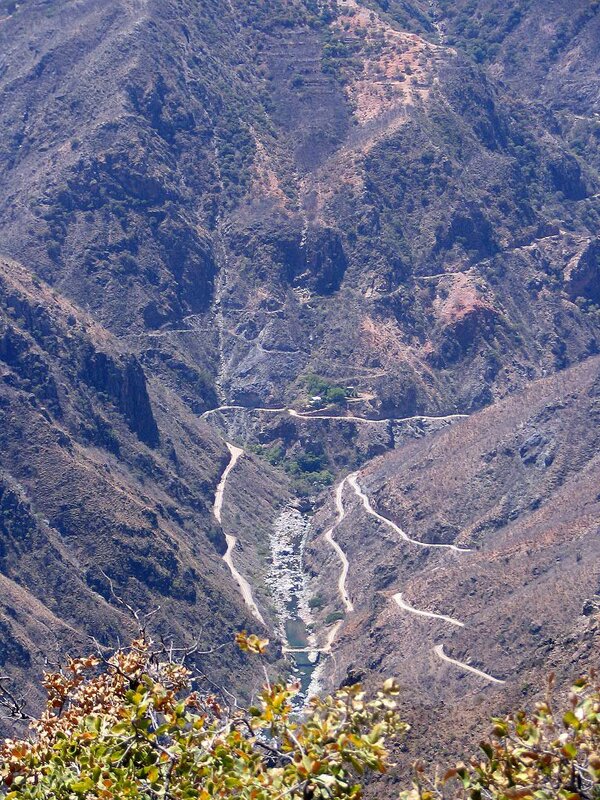 Then the road turns to gravel and begins a serpiginous trail down the canyon about 6000 feet in 65 km. The road is mostly one lane, and, at the meeting of vehicles, one has to back up to the nearest wide spot to pass the other. The road perches on the precipice through much of its course, couple thousand foot drops being fairly routine. Needless to say, the scenery was stunning. Our driver Luis was extremely responsible and careful and we felt we were in good hands. He did tell us stories of some vehicles that didn’t do so well, tumbling off the hillside to their demise—usually the drivers had been drinking. We stopped for lunch at a stunning overlook. On the road we passed cows, burros and goats that walked free range looking for grazing grounds. 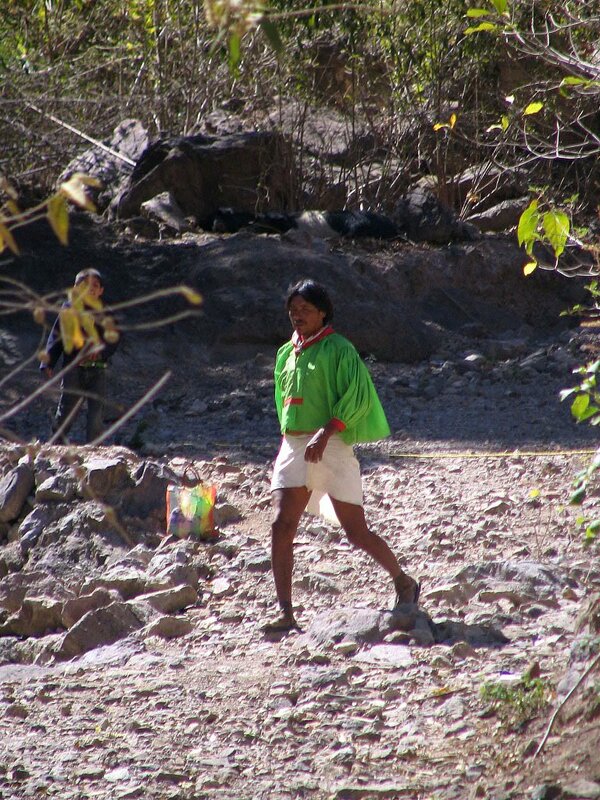 We saw Tarahumara walking the goat trails along the sides and saw one trail for the schoolkids who walk 1.5 hours each way to school down, across the river, and then up the steep canyon sides. When we reached the bottom of the canyon, the temperature had gone from chilly (it got into the 30’s F at the top) to hot, in the 80’s and tropical with mango, banana, papaya grown at the bottom. Apparently high temperatures in the summer in the canyon get to 120 degrees F! The town of Batopilas developed into a rather comfortable town with the discovery of silver and development of extensive and successful silver mines. A US senator, Alexander Shepard, had left after a scandal in the US in the 1800’s (I know, amazing, a scandal involving a US politician) settled in Batopilas and was instrumental in the mine development. He assured that the town was the second in the country of Mexico to receive electricity (after Mexico City). Now the town population is only 1400 or so and the mines are no longer active, but it is still a charming village crammed between steep canyon walls, lining the river Batopilas, with essentially one main one lane road through town, and picturesque town square. While there we visited La Catedral Perdida, the lost cathedral, about 5 miles outside of the village that was beautiful and originally built by the Jesuits in 1600, rebuilt by the Franciscans in 1803. There, after our tour, we met some local kids, a beautiful girl of 13 who carried a note with her requesting support for her expensive epilepsy medications. Betsy “discussed” her epilepsy with her in limited Spanish, learning that she had up to 30 seizures a year until the last couple years when her current medication was started and is now keeping her seizure free. After she finished her “pathetic” act to get money from us tourists (and we did give of course), she became a normal kid with a sister and some other friends and we played with them outside the church—she had some tricks she showed us, Geordie did a couple magic tricks and Betsy juggled some rocks. We all had a good time. Then it was time to return to our hotel for the night outside the town of Batopilas. 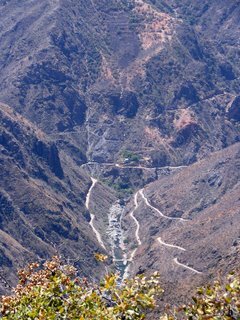 (The road down the canyon is so tortuous that it is only traveled one way in a given day—even the local bus goes one day and returns the next.) The hotel was also owned by Margarita, but this one is a luxury hotel and is stunningly gorgeous. The rooms are large and airy and the bathrooms are unbelievable with extensive tile work—even the tub is all tile. We wished we could have stayed more than one night, but the tour returned the next day. As with her hostel, breakfast and dinner were included and we ate in a roomy dining room full of antiques from the silver mining days, having a delicious dinner of chili rellenos and a delicious breakfast the following AM. Before returning to the top of the canyon, we took a tour of a local silver mine—walking almost 0.5 km into the mountain and seeing some silver veins that have yet to be mined as well as some bats and all the tunnels that had been developed over the years. Fascinating. The trip up was less harrowing from our day before experience. We did have a flat tire which the driver changed in record time and also stopped to help another truck with its brakes while we and the local Tarahumara folks looked on to watch. We were happy to return to the mountain fresh air at the top and have a few hours to enjoy Creel again both that day and the next morning before our train trip back to the boats. We made the decision to return by second class train as it is half the price albeit a slightly longer trip (more local stops) and minus the luxurious dining and bar cars. Richard and Geordie hopped aboard the Segundo train the night before we left to check it out, and the stop was so short, they almost ended up being passengers to Chihuahua, but managed to jump off as it was pulling away. They confirmed that the seats were equally comfortable and certainly the view was the same. Even more fun, we were nearly the only gringos on the train the next day and we thought the money savings absolutely worth the near lack of difference in the trains. We pushed back over 16 hours of travel or so, arriving back at Mazatlan at 5 AM to avoid another hotel expense and because we all were eager to return to the boats. The experience was amazing, beautiful and eye-opening and we all raved about it as we went through the pictures Erin and Richard had taken. Sadly, our friends the Grants are heading out to Hawaii soon, but we look forward to visiting them in Victoria when next we are in the Pacific NW. For the 2 nights before we got to Mazatlan for our Copper Canyon adventure, we stayed once again at Isla Isabella. There we walked the island in a fantasy land of birds. 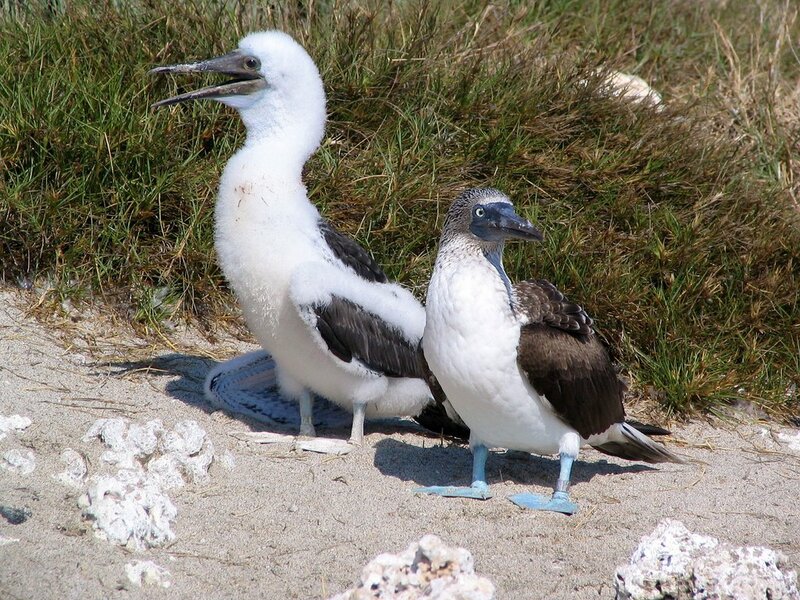 The blue footed boobie chicks had hatched (there were mostly eggs when we were there in January) and were at an age when they are larger than their parents and looked like big fuzzy white Big Birds (from Sesame Street). 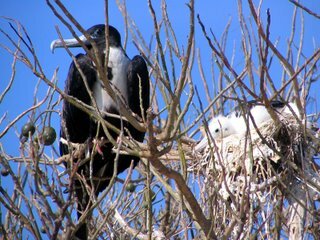 The parents were more aggressive about keeping us away, but we were often 3 feet from their nests along the trail. 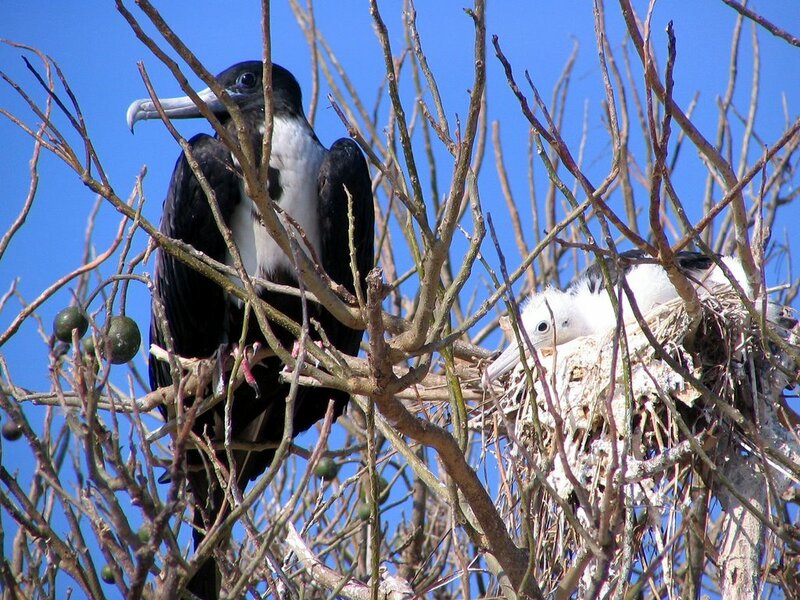 Then, in the scrub trees along the trail, we got to see the new Frigate bird chicks as well, sitting each in their own little nest on the tree branches. It was unbelievable the density of the birds on this island. When we got to the fishing settlement at one end of the island, there was a whole cement wall of iguanas sunning themselves. Later in the day we went snorkeling in absolutely crystal clear water (50 ft visibility?) and saw huge schools of beautiful tropical fish among the rocks and reef. Wow, what a treasure, we love this island! !